The Zebulon Pike Chapter NSDAR was formed in 1895, in Colorado Springs. Our founding members chose the name "Zebulon Pike" in honor of Zebulon Montgomery Pike (1779-1813), American explorer and army officer, as an homage to the explorer. Like our famous namesake, the members of Zebulon Pike Chapter seek adventure in discovering new ways to serve our community and fellow man. In our steps, we choose to build helpful relationships in education, serve our veterans, connect women with their patriotic ancestors, and seek opportunities to preserve and protect our local history. We are women of many ages, many backgrounds, and many points of view. These Daughters come together to unite in service to better our community, our chapter, and our national organization. We are the 2017-2019 board members and directors of Zebulon Pike Chapter, NSDAR. Zebulon Montgomery Pike (1779-1813), American explorer and army officer, was born in Trenton, New Jersey. He entered the army about 1793 and became a second lieutenant in 1799. In 1805 he led an expedition to discover the source of the Mississippi River. The following year he set out on another expedition through the newly acquired Louisiana Territory; and in his travels, he traversed Spanish territory. Historians are undecided as to whether Pike strayed or intended to spy. He was captured but released by the Spanish. Pikes Peak in Colorado, which was first sighted by him on this expedition, bears his name. 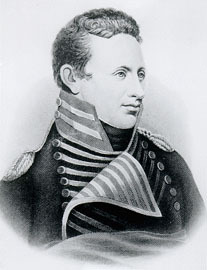 During the War of 1812, as a brigadier general, Pike directed the assault on the town of York (now Toronto), Canada, and during the fighting he was killed by the explosion of a powder magazine. On January 24, 1895, a group of women met to organize the first chapter of the DAR in the State of Colorado. The women who met that day were very active in politics, their churches, and service organizations. They belonged to lineage societies and literary groups. They were involved in musical organizations and educational institutions. The women were the civic leaders of their time. They were the charter members of the Zebulon Pike Chapter, NSDAR. The charter members lived close together in the central part of Colorado Springs. According to a map at that time, there were only about eighteen city blocks between the most extreme locations of the residences of the charter members. The women’s age spectrum ranged from 21 to 67 years of age, with most of the members’ ages ranging between 40-50 years. Their ages provided a wonderful mixture of energy and talent. 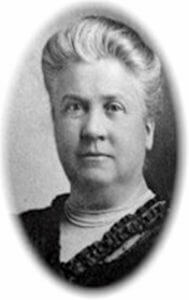 The preliminary work for this first chapter was done in August, 1894, when Mary Goodale Montgomery Slocum’s application for membership to DAR was approved and she was appointed the Colorado State Regent. It’s quite possible that Julia Platt and Elizabeth Cass Goddard, close neighbors of Mrs. Slocum and themselves DAR members from back east, were instrumental in her appointment to this position. The meeting on January 24, 1895, was held in Mrs. Slocum’s home on the campus of Colorado College. Mrs. Slocum’s husband was at that time President of Colorado College. At the time that they met, a rising vote of about 25 indicated that they “felt disposed to join the DAR.” Mrs. Goddard signed the minutes as secretary. 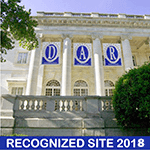 At the meeting held on May 13, 1895, it was voted that a DAR chapter would be formed. This is the date that is shown on the Zebulon Pike Chapter charter. Mrs. Goddard was elected regent, Mrs. Charles Eldredge was elected secretary-treasurer, and Mrs. William Platt was elected registrar. 1 Patriotism - A few of our veteran activities include: Zebulon Pike's participation in the Colorado Springs Stand Down, Crawford House support, donations to devastated structures where veterans have been affected, a magazine drive, and marching in the Veterans Day Parade with the other DAR chapters in Colorado Springs. Genealogy workshops are offered to the public at least six times per year. 2 Education - Zebulon Pike Chapter is concerned about Literacy. Several members volunteer in classrooms to help with reading; and in one under-served public school, purchase a book for every child in the school during the holidays. Scholarships are awarded for outstanding college students in American History at Colorado College and the United States Air Force Academy. DAR Good Citizens Awards are presented as deserving high school students are recognized. 3 Historic Preservation - Many historical markers have been placed on the famed Santa Fe Trail by Zebulon Pike Chapter. Constitution Week is proclaimed by the head of the Colorado Springs Town Council and displays are placed in the main Penrose Library downtown Colorado Springs. Zebulon Pike Chapter works on historical records preservation, Bible record transcription and digitization projects.